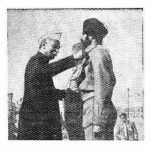 Honorary Captain Karam Singh was born on 15 Sep 1915, at Bhaliawala village in Sangrur district of Punjab. Son of a farmer Sardar Uttam Singh, Karam Singh always wanted to live a life of thrill and adventure since his childhood. His uncle was a JCO in the army and the young boy Karam Singh wanted to follow in his footsteps as he was impressed by his army life. 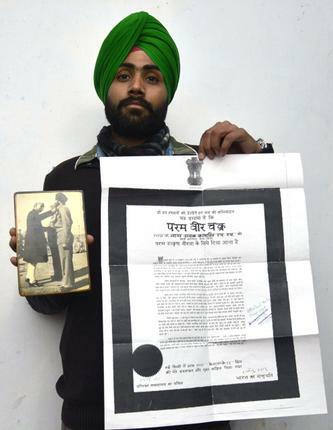 Hon Capt Karam Singh joined the army on 15 Sep 1941 at the age of 26 years. He received his military training in Ranchi and was inducted into the famed Sikh Regiment in Aug 1942. He proved to be a good sportsman in the army and made a name in pole vault and long jump. He participated in the World War II and proved his mettle as a dedicated and brave soldier. Consequently, the British Government awarded him the Military Medal, the gallantry award of Britain. During World War II, Hon Capt Singh faced Japanese soldiers at the Burma Front in 1945. He fought in the deep jungles of Burma against the formidable force of the Japanese. For his astute bravery and skill, he was awarded the gallantry medal of Britain, the “Military Medal” on 14th March 1944. During the J & K operations in the summer of 1948 the Indian Army made substantial gains in the Tithwal sector. Subsequently, on 23rd May, they seized control of the Tithwal sector. The enemy had no choice but to abandon the mission. They were however far from letting Tithwal go without a fight. The Battle of Tithwal went on for months with the Pakistani army constantly vying for its capture. They could not, however, make a dent on the Indian defences. The re-capture of Tithwal, with Richmar Gali as a vital objective, became the Pakistan Army’s main goal. To achieve this objective, a reinforced Brigade, with artillery, was deployed to encircle the position. On 13th October 1948, the Pakistan Army launched an attack with a Brigade strength to evict the Indian Army from their strongly held positions. The attack saw immense fighting in the Richmar Gali region and heavy shelling of guns and mortar. The enemy fire took out the communication lines. 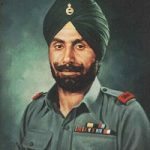 During this time, the then Lance Naik Karam Singh was commanding a forward outpost in the area. The enemy troops heavily outnumbered the Sikh Regiment and launched no less than 8 attacks on their post. The Indian troops fought fiercely and Lance Naik Singh went around helping his troops and battling the enemy. Eventually, their ammunition supply ran out and at this point, Lance Naik Singh joined the main company position. He was wounded but did not lose hope and helped save two of his comrades. The enemy fire rained upon them and it was near impossible for them to break out. 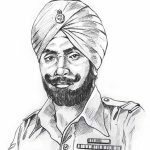 But the then Lance Naik Singh did not falter and went from place to place, encouraging his men to fight and charged the enemy with his grenades. Though grievously wounded, he refused evacuation. During the fifth enemy attack, he fought hand to hand with two enemies and bayoneted them to death. His actions inspired his men and demoralized the enemy. Finally they fought off the last attack on the night of 13th October. The Sikh regiment had lost 15 men while the enemy forces lost nearly 300. The enemy could not capture a single bunker. For his absolute bravery and disregard for his own life in lieu of his nation, Lance Naik Karam Singh was awarded the revered Param Vir Chakra. He was the first non-posthumous recipient of the award. His bravery and leadership saved the coveted position of Tithwal and inevitably changed the course of the war. He became the only Indian to receive the highest gallantry award from both Indian and British governments. 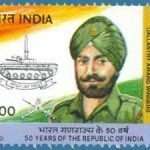 He retired from the army as Subedar and Honorary Captain and left for his heavenly abode due to natural causes on 20th June 1993 at the age of 77. 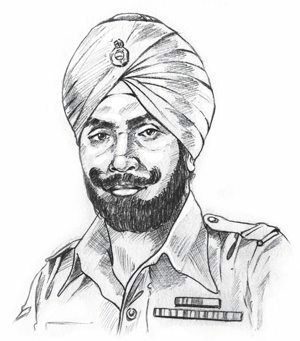 Hon Capt Karam Singh is still remembered today as the ‘Sardar’, the leader, the man of steel. He will go down in the history as one of the greatest soldiers of India and will continue to inspire future generations. Tithwal in Jammu and Kashmir was captured on 23 May 1948. After that date, the enemy made numerous attempts to recapture Richmar Gali, and thence Tithwal. On 13 October 1948, coinciding with Id, the enemy decided to launch a brigade attack to retake Richmar Gali, and bypassing Tithwal, advance into the Srinagar Valley. Lance Naik Karam Singh was commanding a section at Richmar Gali. The enemy commenced its attack with heavy shelling of guns and mortars. The fire was so accurate that not a single bunker in the platoon locality was left unscathed. Communication trenches caved in. 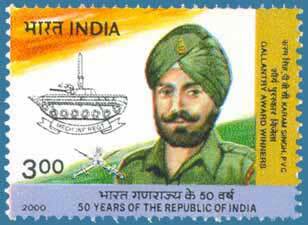 Bravely, Lance Naik Karam Singh went from bunker to bunker, giving succor to the wounded and urging the men to fight. The enemy launched eight separate attacks that day. In one such attack, the enemy managed to obtain a foothold in the platoon locality. 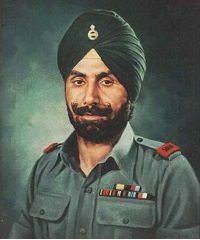 Immediately, Lance Naik Karam Singh, who was severely wounded by then, with a few men, hurled himself in a counter-attack and evicted the enemy after a close quarter encounter which accounted for many enemy dead, having been dispatched by the bayonet. Lance Naik Karam Singh proved himself to be a dauntless leader of men in crisis. Nothing could subdue him and no amount of fire or hardship could break his spirit. The Shipping Corporation of India Ltd (SCI) named fifteen of her Crude Oil Tankers in honour of the Param Vir Chakra recipients. The crude oil tanker named MT ” Lance Naik Karam Singh, PVC” was delivered to SCI on 30 July 1984. Sub and Hon Capt Karam Singh received the PVC award from the first president of India, Dr Rajendra Prasad. 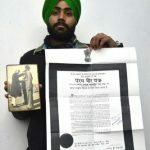 He, along with four others, was selected by Pandit Jawaharlal Nehru, India’s first Prime Minister to hoist the national flag after Indian independence on 15 August 1947. Your story of courage and sacrifice is truly remarkable. My salute to you.